Denon has fleshed out its HEOS multi-room audio system with a sound-bar/subwoofer combo. Dubbed HEOS HomeCinema, the system replaces the craptastic speakers in flat-screen TV and hooks into your Wi-Fi network to add a zone for listening to music. Denon kicked off its HEOS line a year ago. At the time, it consisted of three speakers, including the HEOS 3 ($299) suitable for a small bedroom or home office, HEOS 5 ($399) for larger bedrooms and small living room setups, and the HEOS 7 ($599) for bigger rooms. Then last month Denon added the HEOS 1 ($199), a portable two-way speaker, and HEOS 1 Go Pack ($99), an accessory kit that adds a Bluetooth USB adapter, 6-hour rechargeable battery, and a splashguard for outside listening. The audio manufacturer announced at CES that its HEOS line would also become compatible with Google’s Cast for Audio initiative. Why this matters: Denon is a heavyweight in the home-audio industry and has positioned itself as one of the growing number of alternatives to Sonos, which incidentally is suing the company for allegedly infringing on four patents. The lawsuit hasn’t slowed Denon down, as it was filed in October of last year. Inside the new soundbar are dual rounded rectangular mid-woofer drivers for midrange and upper bass, and dual 20mm treated soft dome tweeters with neodymium magnets for hitting those high notes. The wireless subwoofer adds dual 5.25-inch drivers to deliver what Denon claims is “authoritative deep bass” without distortion. The soundbar includes an HDMI input and output (with TV audio-return channel), along with optical, coaxial, and auxiliary inputs. It supports Dolby Digital, Dolby Digital Plus, and DTS decoding. Dual-band Wi-Fi support lets you add the speaker to either a 2.4- or 5GHz wireless network. 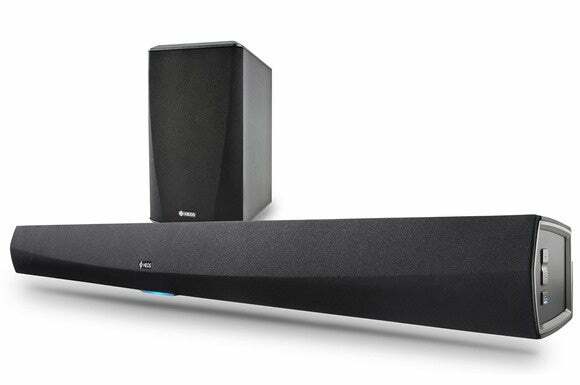 Once the soundbar and subwoofer connects to your home Wi-Fi network, you can control the audio through Denon’s free HEOS app, available for Android, iOS, and Kindle Fire. The duo operates as an independent HEOS zone for music, and like the other HEOS products, you can stream from several online services, including Spotify, Pandora, SiriusXM, Rhapsody, tunein, iHeartRadio, and Tidal. Denon says support for more music services will be available soon. Through the app, you can also play back music stored on your phone or tablet, as well as access playlists on a USB storage device that’s connected to any HEOS player. Regardless of where the music comes from, you can play a different track on each HEOS player, the same song on all of them, or listen to tracks in a single zone.